It’s here! It’s my day! (Are you spooked yet?) 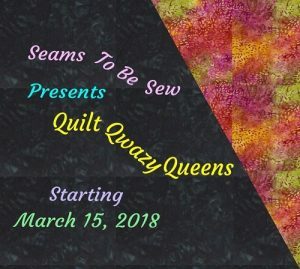 Seriously, though, Marian at Seams to be Sew has lined up a awesome set of sponsors for this year’s hop. On top of that, Timeless Treasures is giving away a different bundle every day. Now, I personally don’t know anyone who doesn’t like more fabric! Click here to win this adorable bundle…those pickles look so real that my mouth is watering just a little! 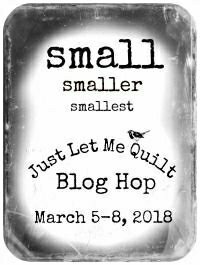 I get to share today with the following talented quilters….I’m always so grateful to be included with these people! And, if you missed them, get inspired by looking back at the other stops! I’ve still got plans for a couple more borders. In case you are wondering, it’s about 60×60 so far and I need to add some length before the final borders go on. 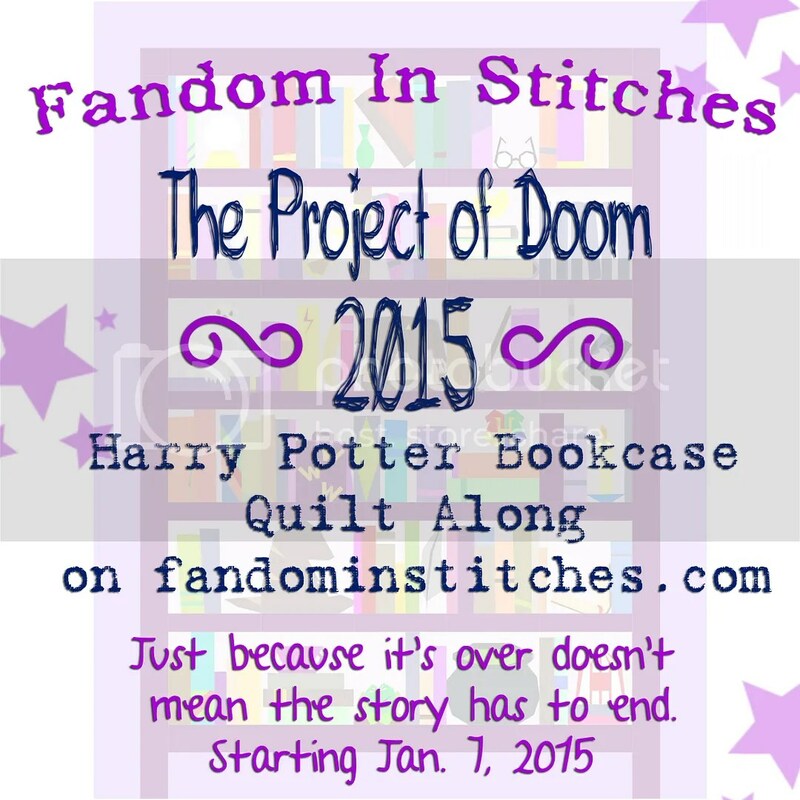 One thing’s for sure, I’m going to finish it and move on to a new project for next year! The eyes are a free pattern from Whims & Fancies from a prior hop and the Boo! is free hand pieced in the style of the book Word Play. Despite it not being finished, I hope you enjoy my offering. In the course of making all those four patches to use up my Halloween fabric, I’ve acquired a bunch more. Time to start next year’s project! Enjoy the hop and thanks again to Marian, Fat Quarter Shop and Timeless Treasures for making this a “Spooktacular” experience! Great Halloween quilt! I love the kitties in the stars! A spooktacular and amazing quilt! Boo-tiful quilt! I love the block combination and the fabrics you chose. A great big “Boo” to you, too! Love the eyes! I love your quilt! It just sparkles! I love Halloween quilts, and yours is fantastic. 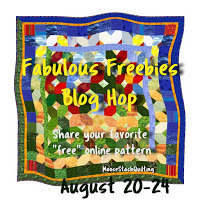 Love the quilt – and great inspiration for me! – I went to my stash to pull some Halloween fabric for towel toppers – boy have I accumulated a lot of Halloween fabric – leftovers as well as uncut pieces – time to plan! That is great. The colors are wonderful. You will love having it to display each Halloween. Your quilt is fabulous. I really need to get some orange scraps and make one for next year. The “eyes” have it! They are the perfect center for this quilt…all great fabrics with just the right colors! What fun to pull out each Halloween season. That is so cute! I love the cat eyes! Great quilt! Just the right amount of spooky! Thanks for sharing. I love it. Great combination of designs. What an amazing Spooktacular Quilt. 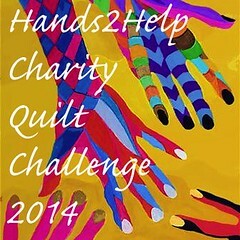 Love your quilt–can see it is great to use the stash with! I love the cat fabric! I love the Boo with the cat eyes, so scrappy and cool. 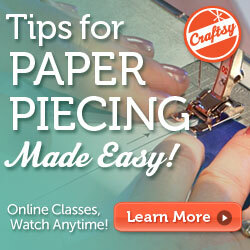 The pieced block that surrounds it is perfect to highlight the other areas of your quilt. Can’t wait to see it finished Beth. Very cute, thanks for sharing and the giveaways!! Very cute! I love the eyes! Thanks for sharing. WOW! Great Halloween quilt. You out did yourself on that big project & it turned out perfect. That is so cute. BOO! You did a lot of work with all those small squares, 2 inch? 🙂 Thanks for the fun! It’s so “eye-catching”! You did great! Love the eyes on your quilt!!! 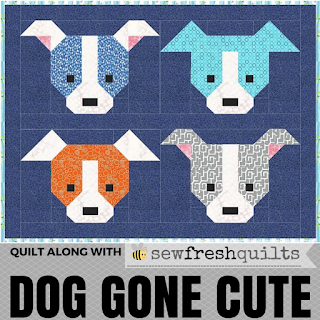 Great project, love the eyes and all the scrappy squares. oh my goodness!!!! This is one of my favorites of yours!!!! So much going on without it looking too busy…just like Halloween itself!!! you truly are the queen of Ween!!!! Gotta love the scrappy – I would have liked to have seen a close-up of it. The colors are great in this and those eyes are my favorite! That is a pretty cool Halloween quilt! Thanks for sharing! Love it, the cat eyes really stand out. Looks very cool and spooky! Love those scrappy quilts, and making do with what you have. Great job! What a wonderful work in progress. I love the spooky eyes. The cat eyes made the perfect addition! Your quilt is coming along just great! I like the design and fabrics! THANKS FOR SHARING>LIKE THAT CAT!!! Thank you for sharing your talents. Love you Halloween quilt. Your quilt is very nice so far. 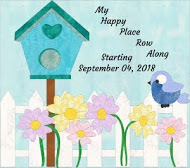 I know how it will feel to finish it and make something else next year. I love the cat eyes. Thanks for sharing your project. Great quilt–the colors, the design! Love the spooky cat in the center block! Very colorful. Your quilt is turning out great so far! Can’t wait to see it finished too. Thanks for sharing. WOW!!! AWESOME qulilt!!! You did super job…looove it! Little wonder that you haven’t finished yet . . . this looks like one labor-intensive quilt! But it’s lovely . . . . can’t wait to see the finished project. Wonderful quilt. Thanks for sharing. That’s great! I like that it’s Halloween, but not right in the face about it. Just as cute as anything! That is just darling! Very creative. So cute! Love the cat eyes. Beth, you are just speaking to my soul. You know I love scrappy and Halloween. This is just a fabulous combination of them both! Love all of these fabulous projects. Lots of inspiration. Those eyes are MEZMERIZING! What a great result.